Hot Air Balloons Launch – 6:30 p.m.
Safelite AutoGlass Sundown Parade – 6:30-8 p.m. Twilight Pops Concert featuring the Wichita Symphony Orchestra – 8:30-9:30 p.m.
Kansas Health Foundation River Run– 7-11:30 a.m.
Admirals’ Pancake Feed – 7:30-10 a.m.
WichiCon at Riverfest– 10 a.m.-7 p.m.
Stock Tank Races – 2 p.m.
Jet Ski Races – 3 p.m.
Full STEAM Ahead: Fun with Science, Technology, Engineering, Art and Math – 11 a.m.
Take Flight & Butterfly Festival at Botanica Wichita– 1-5 p.m.
Cardboard Regatta Launch – 3:30 p.m.
Riverfest Matinee Movie – 11:30 a.m.-1:30 p.m. The Last Carnival – 7 p.m.
Phlox Kansas – 9 p.m.
Festival of Broadway – 6-9:15 p.m.
Riverfest Paddleboat Races – 6 p.m.
Hiland Ice Cream Social – 6 p.m.
Free Wingnuts Game (with Riverfest Button) 7 p.m.
KAKE Touch-A-Truck – 5-8:30 p.m. 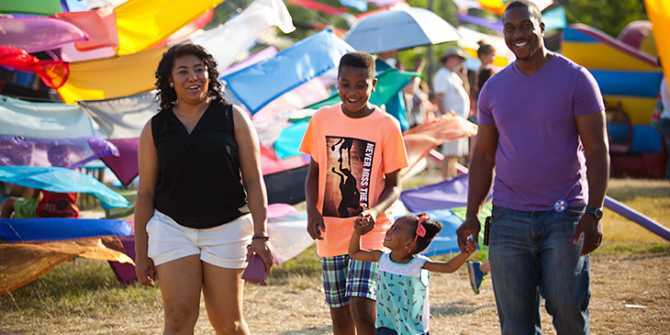 Goodwill Cajun Food Fest – 5-8:30 p.m.
Spring Kidfest– 11 a.m.-8 p.m.
Dinosaur Day – 11 a.m.-10 p.m.
Riverfest Classic Car Show– 11 a.m.-10 p.m.
Kayak Races – 6-8 p.m.
Capital Federal Fireworks Finale – 10:30 p.m.
For more events and maps, click here for info on Wichita Riverfest.